FAQ | McCary Jewelers Inc.
Q: In the “4 C’s” Carat, Clarity, Color and Cut, does cut have different meanings? A: Yes, cut is one of the most important factors when purchasing a diamond and it has two distinct meanings: the shape of the diamond and the quality of its proportions. Q: What are the different shapes of a diamond? A: The Round Brilliant shape is by far the most popular diamond shape. The Round most effectively displays a diamond’s unique ability to reflect light and to sparkle. When cutting Round Brilliant diamonds, the cutter must adhere to a set of strict guidelines that will maximize the diamond’s brilliance. All other shapes of diamonds are called “fancy” cuts – Emerald, Oval, Pear, Princess, Marquise, Cushion, Ascher and Radiant. Q: In grading a diamond, what is the most important element? A: The cut is arguably the most important element because it is directly responsible for the diamond’s sparkle and brilliance. A well-cut diamond is cut precisely to the proportions that yield the most light return. Cut is everything in a diamond. It determines how much sparkle, color, fire, and brilliance. Knowledge of the cut is critical. You can have the best color diamond with the best clarity, but if it’s not cut well, it diminishes its worth. Q: Is it true that the more colorless the diamond the greater its value? A: Yes, if a diamond is cut well, the diamond’s refraction and dispersion often will disguise certain degrees of coloration. Color for white diamonds can vary from colorless “D” Grade and exceedingly rate to light yellow “Z”. Most diamonds possess some degree of yellow or brown. Small differences in color can make a substantial difference in a diamond’s cost. Q: Is there an in-house person to offer advice on how to buy a diamond? A: McCary’s in-house registered jewelers and certified gemologists will review the diamond characteristics at length with you. Our quality standards are among the highest for diamond selection and our customers value the expertise and guidance in this important purchase. Q: What is clarity and how does it affect the value of the diamond? A: Clarity is the evaluation of a diamond’s internal and external characteristics. The fewer inclusions or blemishes a diamond has, the more valuable and desirable the diamond. Clarity is more than cosmetic – a heavily included diamond can be susceptible to breakage. Q: What are the six main categories of clarity? A: The six main categories are Flawless (FL) extremely rate, Internally Flawless (IF) no inclusions and minor blemishes, Very Very Slightly Included (VVS) very minute inclusions seen under scope inspection, Very Slightly Included (VS) minor inclusions seen under scope and small percentage visible to the naked eye, Slightly Included (SI) noticeable inclusions seen under scope and a small percentage visible to the naked eye, Included (I) significant inclusions seen with the naked eye. Q: What clarity range do you recommend? A: McCary’s recommends the VS2 to SI2 range, but the store certainly carries the VVS 1&2 grade diamond. Q: Do you have a wide selection of diamond carats? A: Yes, McCary’s not only has a wide selection of diamond carats, but also as members of the American Gem Society (AGS) and the Gemological Institute of America (GIA), the store can provide that valuable knowledge and skill that is a pertinent part of the diamond buying process. Q: Do you do in-house repairs? A: Yes, McCary’s Jewelers is in one of few jewelers in the area who have six bench jewelers providing hands-on artisan skills for repair and jewelry making. Our jewelers are afforded greater capabilities and versatility due to the state-of-the-art laser welding machines used in our shop. Q: Do you change watch batteries? A: Yes, we change watch batteries usually while you wait! We can also remove and add links for resizing, as well as change the watchbands. McCary’s will work on items purchased or not purchased from McCary’s, with some exceptions. Q: How often should I get my jewelry checked and cleaned? A: McCary’s recommends a check and cleaning every 6 months for the safety of your jewelry. This is free of charge and can prevent many mishaps in the long run. McCary’s will work on items purchased or not purchased from McCary’s, with some exceptions. The customer should bring the jewelry in and review with one of our registered jewelers. Q: Can you create custom pieces of jewelry? Q: Can I use my jewelry to create something new? A: Yes, McCary’s can help you maintain that sentimental value of family heirlooms or even just gold or jewelry items that you kept over the years with intention of passing down. Whatever the jewelry item, our experienced jewelers will work with you on a design and quality production. McCary’s will always recommend a high grade quality gold stock for casting, that is alloyed with premium metals and the purity and consistency that meets our jewelry standards. The jeweler will utilize the diamonds and other precious stones of the jewelry brought in. Q: With custom work, do you do your own castings or outsource? A: McCary’s does all casting in-house starting at the wax bench with a carved piece of wax formed into a mold of your piece of jewelry. Our experts then cast any type of metal you want in the mold and create handmade custom jewelry. You are welcome to bring in sketches or magazine clipping references to begin the custom process, but our experts will also lead you. Q: Can custom work be any piece of jewelry? 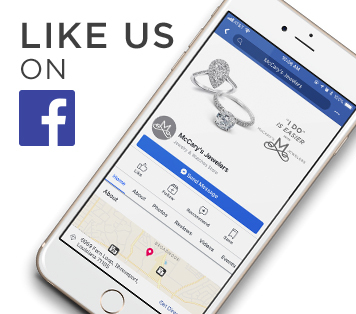 A: McCary’s custom creates brooches, bracelets, rings, earrings, pendants and the like for any type of jewelry including wedding rings. Q: Do you do engraving? A: Yes, McCary’s can do in-house engraving usually within less than a week. Engravings can be done on a number of items including money clips, jewelry, gifts, and the like. Q: Do you offer custom work for graduation rings? A: Graduation rings have progressed from that old high school class ring style to a contemporary piece that will take them far past their senior year in high school. You can select what type of metal, stone, and ring you’d like. We also have a tremendous inventory selection of rings for young women and men, as well as watches for the young men. Q: Do you have gemstones on hand? A: McCary’s has one of the largest inventories of colored gemstones in the Ark-La-Tex area that range from common to uncommon types of stone. There are very few types of stones that we don’t have or can’t get. Q: If I bring in a stone, can you tell me what type of stone it is? A: McCary’s has certified gemologist to run gemological tests to determine the type of stone. The gem lab refractometer and the experience of certified gemologists provide precise analysis on the stone. Q: Do you perform in-house jewelry appraisals? A: Yes, jewelry appraisals are performed in-house by certified gemologist. To have a proper evaluation, you will need to leave the jewelry for cleaning and testing, and there is a cost associated with this service. You will receive a description of the piece, current market price of gold per ounce and also the replacement value.